Thomas blinked. The empire he’d built, brick by brick, was crumbling, exposing to the corrupting air the bodies he’d piled up for its foundations – the enemies and friends he’d crushed in his ascension – and all this yellow-eyed parasite could say was ‘sorry’? “You’re making an enormous mistake,” Thomas said. The boy smiled, taking an apple from the desk, testing its skin. 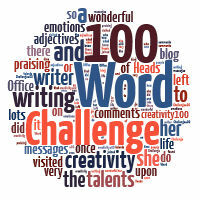 This is my response to the 100 Word Challenge for Grown Ups. This week’s prompt: write a piece to include the words LIBERTY EMPIRE APPLE YELLOW and ENORMOUS. Follow the link to read the other responses and submit one of your own! Comments and links more than welcome below. And so he does. I can see them now, this is so real. ooh i wonder what happens next!